The title can be translated as "eat again," and Ata Damasco' second album is a feast indeed. It is almost a one-man project since he plays most of the instruments and sings. His guests -- a steel guitarist here, backing vocalists there -- enhance the pure traditionalist ambiance of this perfect Hawaiian album. 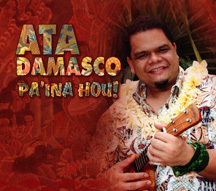 Damasco's skill as a falsetto vocalist makes his "Kalama'ula/E Mama E Medley" an instant favorite. No question about it, he not only has a beautiful voice but has also mastered the technique of breathing and singing simultaneously. All but one selection is a Hawaiian or hapa-haole standard. Each is beautifully done. In the one original, "Eclipse," Damasco describes a 1991 solar eclipse as "the joining of the moon and the sun" -- in other words, of woman and man -- and therefore finds it appropriate that clouds hid their "joining" from most observers on earth. That story is one of many nuggets of valuable cultural information included in the liner notes. 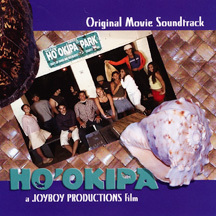 "Ka Ala A Ka Jeep"
This soundtrack is unusual in providing no information on the film it comes from. It's natural then to wonder if there is a movie at all, but there are such divergent styles of music here that it's hard to see anyone buying the album except as a memento of a film. On one end of the spectrum are three beautiful Hawaiian songs -- two by Cody Pueo Pata and a third by Pulama Collier. At the other end is the straight hip-hop of the Assault Squad Riderz featuring Maka, who make reference to Hawaii but whose music and delivery is strictly mainstream. Hayley and Bubs add appealing Jawaiian-pop with a solid bass line but a generic faux-Shaggy rapper. Kahele sets a fine example for other local reggae and Jawaiian acts by doing an original entirely in Hawaiian. Unfortunately, an English translation or synopsis isn't included in the annotation so few reggae fans will get the message -- whatever it may be. 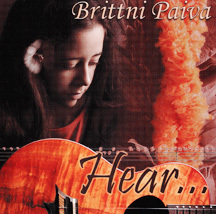 Brittni Paiva's first album, "Brittni X 3," was a home-brewed solo project that won her a Hoku Award. She worked with Wendell Ching in a conventional studio for this one, and it's a fine showcase of her versatility as a musician. Multi-tracking allows Paiva to interpret "Opihi Moemoe" with guitar and bass, "Kani Ki Ho'alu" with guitar only, and "Akaka Falls" with guitar and ukulele. She plays all three instruments on "Lahaina Luna," featuring first the uke and then the guitar while using the bass to provide a solid foundation. On "E Lohea Mai," she sings too. This variety makes the album much more interesting that it would be if she played all three instruments on every track. Ching sits in on drums to reinforce the rhythm section on "Ukulele Boogie," an original that could easily become her signature as a ukulele player. He also joins Paiva on her reworking of "Take Five," but they wisely avoid the temptation to add synthetic strings or other sonic filler. Count on Paiva to be a Hoku Awards contender again in 2006.